I’ve started keeping track of how adding highlights to a Kindle book moves it up the “most highlighted book” list on Amazon. In the course of one day, my notes remained the same at 8. But the ranking dropped from 28,481 to 28,589. So one can assume that out of the entire universe of Kindle books that had 8 notes, 108 of those books got additional notes in one day. it would be interesting to take a set of twenty books. Each book has a consecutive number of notes. So one book would have one note. Another would have two notes. Another has three. And then track how the ranking changes for all those books. You would be able to track how many books get notes added every day in the Kindle universe. We just launched two eBooks today on amzon. 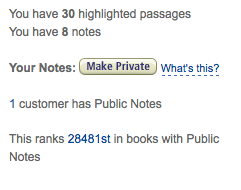 They currently have a ranking of 20,745th in books with Public Notes. Ten minutes later it’s 20,752nd. It dropped 7 ranks in a matter of ten minutes!